I spent a great deal of the past year in my head: reading every word Shakespeare wrote. Again. And again. Researching not only him and his work but also that of his peers and his sources. Writing about all of it and presenting some of it in class and at conferences. The area above my neck was lit up like the skies on Guy Fawkes Day. I neglected that whole inconvenient part of my body below my neck, which conveniently carried that head around for me. I adopted with gusto the when in Rome mentality in Stratford and ingested and imbibed local specialties enthusiastically. I didn’t meet a scone, a plate of fish and chips, or a pint of Guinness that I didn’t devour. And while my lack of wheels meant that I walked a great deal meant that I walked a great deal, I couldn’t keep up with the calorie accumulation. My body suffered gladly for Shakespeare. Returning to the States, and to Westport, has left me feeling unsettled. Friends and family are familiar and welcoming, but other facets are harder to acclimate to. I feel like an organ that’s been removed from a still vital entity – although that entity will thrive without me – and transplanted into a new one. I’m glad to be back in this community, but I miss the other one sorely. 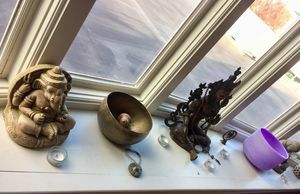 One place that has always felt like home is the yoga studio where I practice and teach (as a substitute instructor). Just walking up the stairs at Yoga For Everybody in Fairfield calms me down. Fortunately, and very serendipitously, they were just about to begin one of their 30 day challenges: practice every day for 30 days, and notice the impact. All that time in my head (an admittedly dangerous neighborhood at times) had left my shoulders in a perma-hunch, my wrists sore from typing, my eyes strained from staring at computer screens and small print, and the rest of my muscles tight and descending into rapid atrophy. Thirty days on the mat has effected a huge transformation, reconnecting the eight-to-ten pounds above my shoulders to the I-won’t-mention-how-many pounds below. Yoga is really more about that union of mind and body – it literally means union – about learning to be fully present in both – than being able to twist Lululemon-clad, fat-free limbs into pretzel shapes. 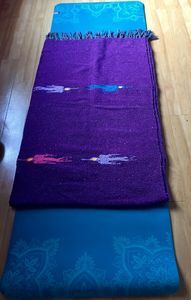 When I sit on my mat, I feel all the places where my body makes contact with the surface. When I sit on my mat, I feel my breath in my nostrils, in my ribcage, under my collarbones, and in my abdomen. 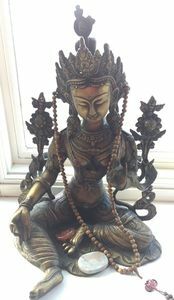 When I sit on my mat, I feel my shoulders hunch and jaw clench, and ask them to release again and again. Sometimes I leave my mat to run errands, replay an annoying conversation, or plan dinner in my head. Then I just gently coax myself back into the room, back into my body, back onto my mat. 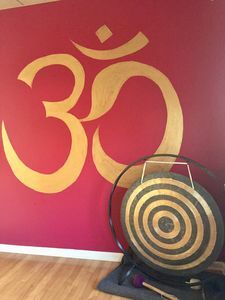 The beauty of the practice is that when done regularly (I’ve been practicing for 18 years), the skills and habits cultivated on the mat seep into life off the mat. I notice when my shoulders hunch or my breath becomes rapid and shallow because some moron cut and flipped me off on the way to yoga, and simply release them and slow my breath. Over and over. A hundred times a day if necessary. One of my favorite teachers told me that the aim is not necessarily avoiding the hunched shoulders and clenched jaw; it’s just noticing them. No one will mistake me for the Dalai Lama’s successor; those who know me well are nodding their heads vigorously now. I’m far from enlightened; I’m just on the path. The path that starts on the mat. I still miss Stratford Upon Avon and all its denizens, including Shakespeare, sorely. I am still navigating the vagaries of the transition back. But I am very happy to report that my body and mind have found each other in the endeavor, paving what feels like a bumpy road to make it smoother.